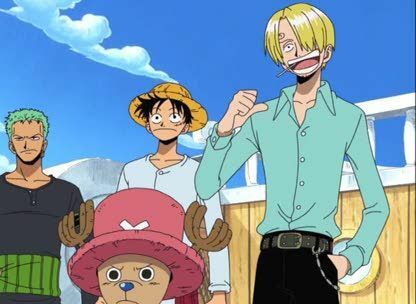 Stream anime episodes online for free, Watch One piece Episode 132 English version online and free episodes. Anime Episode guide One piece Episode 132 English dubbed Uprising of the Navigator! For the Unyielding Dream! While fishing with Chopper and Usopp, Luffy fishes an ammonite-shaped vehicle out of the sea. The pirates debate if it is edible, but to their surprise, its side opens and a traveling salesman emerges. He offers them obscure items and tries to sell a pile of paper to Nami. However, before he can settle the deal, the salesman realizes that he is on a pirate ship and flees in panic, abandoning his merchandise. With the paper, Nami can finally begin drawing the map of the world that she has dreamed about making since her childhood. However, because the rest of the crew is causing mischief, she has trouble completing her work and has to restart twice before finishing her map of Reverse Mountain.